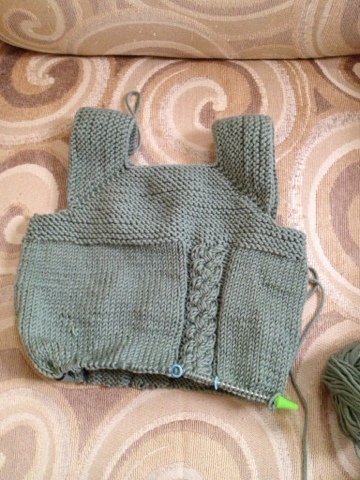 I began knitting another Milo vest. It's just a nice project to knit. This vest is for my cousin's baby boy born a few days ago. I was supposed to have this vest complete in time for the baby shower last month but you know how that goes.....I didn't get the vest done in time so I just put it off a little more. Really I shouldn't have done so since there isn't much to this project. A relative quick knit with great results. I'm pressing on. I was thinking ahead and set for a larger size meant for the little guy months from now. Good thinking because now I won't fret about the sizing being off in relation to the speed at which I'm finishing the vest. Every time I cast on for this Milo Adelynn assumes I'm making her another vest. She loves her vest so much that she wants more! That's why I think this is going to be my go to baby gift. Practical, lovely, and cute make for a great baby gift.